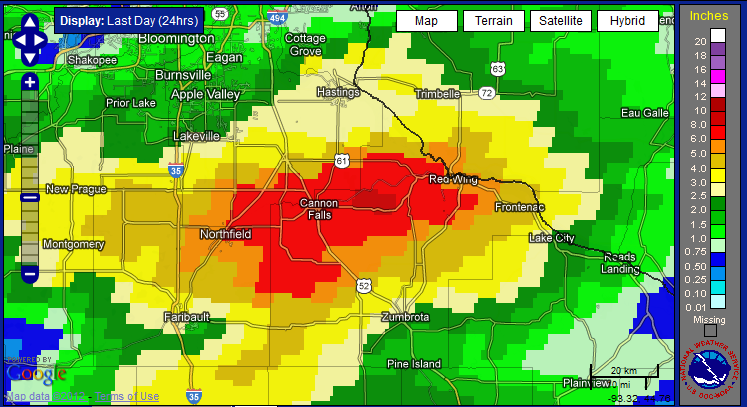 Torrential rains fell during the afternoon and evening of June 14 in Goodhue, Rice and Dakota Counties. Hardest hit was northern Goodhue County with reports of six to eight inches. The highest 24 hour total found so far is 8.83 inches from a National Weather Service Cooperative observer located in Cannon Falls. Another volunteer observer reported 8.40 inches in Stanton Township in northwestern Goodhue County. Another observer located in Northfield in Rice County recorded 7.13 inches. The 8.83 inches measured at Cannon Falls is the largest 24-hour total June rainfall measured at a Minnesota National Weather Service Volunteer Cooperative station in the history of the program. The previous record was 8.67 inches measured on June 17, 1957 at Minneota. The focus for the heavy rain was a stalled warm front that was draped across southern Minnesota. The heavy downpours caused flooding in basements in the hard hit areas, as well as rapidly rising rivers. The Little Cannon River near Cannon Falls rose twelve feet in about ten hours and set a new record crest. The Cannon River at Welch was near a record crest by 10am June 15. Numerous roads were closed in Goodhue County, including Highway 52 during the evening of the 14th. People were being asked to evacuate their homes in parts of Cannon Falls. Public Information Statements and Storm Reports courtesy the National Weather Service. EQUIPMENT AND EXPOSURES. NOT ALL DATA LISTED IS CONSIDERED OFFICIAL. FOR PROVIDING US WITH THIS DATA. HAIL RANGED BETWEEN DIME AND NICKEL SIZE. LINES DOWN FROM KENYON TO WANAMINGO AND ZUMBROTA. HIGHWAY 52 CLOSED DUE TO HIGH WATER. HIGHWAY 246 CLOSED AT COUNTY ROAD 26 DUE TO HIGH WATER. FELL BETWEEN 1630 AND 2330 CDT. HOME EVACUATIONS DUE TO RISING WATER.